Pulse the onion and garlic in a food processor until very fine. Melt the coconut oil in a non-stick skillet and cook the onions until soft and translucent. Chop the cauliflower into pieces. Important: Make sure the cauliflower is DRY. Pat it down with paper towels if necessary. 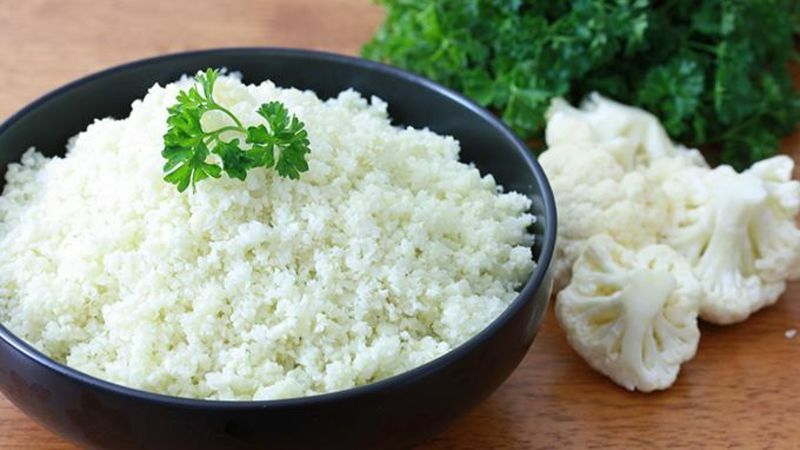 Place the cauliflower pieces in the food processor and pulse until it resembles rice. Add the cauliflower rice to the skillet and cook, stirring regularly, for 5-8 minutes until soft and tender, or leave slightly al dente, whichever you prefer. Serve immediately. Say whaaaat? You got it, cauliflower rice. No, it's not rice mixed with cauliflower. It's pure, unadulterated cauliflower. And it looks like rice. Why on earth would anyone make and eat that? Several reasons. If you're paleo, if you're on a diet and want to add volume without adding calories or carbs, if you're wanting to eat healthier and increase your intake of veggies, or if you're simply adventurous and like to try new things! I don't know about you, but the last couple of months of 2013 came and went, leaving damage in its wake in the form of extra poundage on the ol' bo-dy. So like many of you, I'm kickstarting the New Year on a di-et. This cauliflower rice fits in perfectly with my meal plan. I can virtually eat as much as I want, it's filling, and it tastes good. And there are endless variations. Season it any which way you like: Add some cilantro and lime zest, some lemon zest, some curry powder, a mixture of fresh herbs, or toss in some scrambled eggs, green onions, and a little sesame oil for some Chinese fried rice! You're limited only by your imagination. 1) Don’t cook it covered – it will retain too much moisture. "Dry cook" the rice in an open skillet, stirring regularly. 2) Don’t add any liquid. Cauliflower stores moisture like a three-humped camel in the Sahara. Seriously, if you ever find yourself parched in the scorching hot dessert and happen to come across a cactus and a cauliflower - forget the cactus and go straight for the cauliflower! This brassica baby packs wah-tah! Adding liquid will make your cauliflower rice mushy. And we don't want that. Really, we don't. We want it as light and fluffy as possible...like rice! "Rice, rice, baby (dum-dum-dum-dum-duh-duh-dumdum). Rice, rice, baby..."
Did I just give away my age? Aw, who cares. The cauliflower rice keeps my skin looking young. Gather up aaaaaaaaall the ingredients. Um. Yeah. A grand total of four. Pulse the onion and garlic in a food processor until it's very fine. Place the cauliflower pieces in the food processor. Pulse the cauliflower until it resembles pieces of rice. That's "Rice, rice, baby (dum-dum-dum-dum-duhduh-dumdum)"...yeah, you probably got it stuck in your head, too. Add the cauliflower rice to the skillet and cook, stirring regularly, for 5-8 minutes until soft and tender, or leave slightly al dente, whichever you prefer. Enjoy with some chicken, fish – whatever you want – and add whatever seasonings you like. And there you have it: Cauliflower rice, baby!